Tim Cook and crew are now off stage at WWDC, so as is typical around these parts when Apple announces something “revolutionary” (yes, they used the term again), we like to react. And even though Google has moved away from the series of cheap jabs during their own keynotes, Apple still does them in the bitterest and childish of fashions. If we didn’t toss out some thoughts in support, we wouldn’t be proper Android fans. Because after all, we are still Android fans. So here we go, these are some initial thoughts to Apple’s big announcement of iOS 7 as compared to the current version of Android (4.2, Jelly Bean). 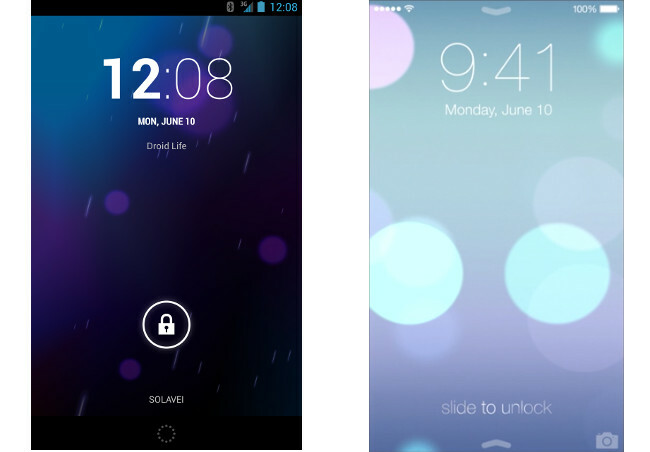 In general, iOS 7 is a newly skinned version of iOS that finally matches up to current mobile design trends. Gone are the leather notebooks and green felt gaming tables – in is a minimal flat aesthetic. And to be perfectly honest, it does look beautiful. Jony Ive and his team did a fantastic job at skinning iOS and turning it into a modern looking mobile UI. But every time Apple does this song and dance, we seem to sit throughout the keynote going, “Whoa, that’s been on Android forever.” Or even, “Umm, that looks just like how Android works.” Today was no different. While iOS 7 looks nice from the outside, many of the new goodies remind us a lot of our favorite mobile OS. And not that we should need to remind you, but don’t take this too seriously. We’re just having some fun and pointing out things that gave us a chuckle. 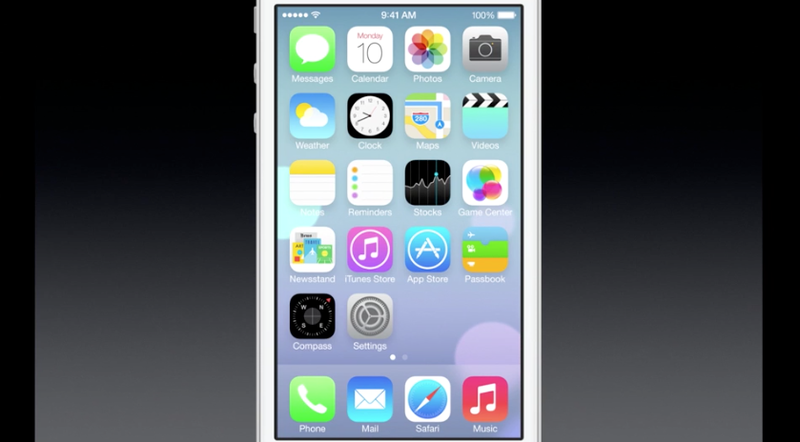 We are happy to see iOS evolve, just like we will be happy to see every other mobile OS evolve. Companies pushing boundaries and taking features to new levels is what we love about this industry. Apple is adding in a gesture for accessing Command Center from anywhere on an iOS device. A quick swipe up from the bottom of the screen and you are graced with a panel filled with toggles for Airplane mode, WiFi, Bluetooth, brightness settings, music controls, camera shortcut, and even a flashlight. As you all know, Android devices have had access to similar information for a while thanks to 3rd party skins from manufacturers. But in Android 4.2, Google introduced a panel as well that can be accessed with a two-finger swipe down from the notification bar. Music controls have been in the notification bar for some time, so that’s not necessarily new. I found this out today, but apparently iOS did not let you access their notification center from the lock screen. 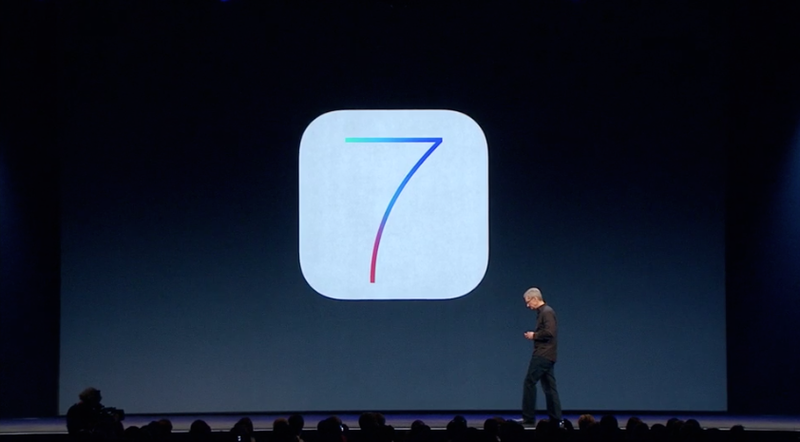 Android has been on this trend for at least two versions, but Apple is just now introducing it with iOS 7. Once released, iOS users will be able to swipe down their notification bar without unlocking their device. The new notification center has done away with that terrible looking felt background and is more transparent. There are tabs for “Today,” “All,” and “Missed.” I like the idea of panels, though Android seems to have been able to handle all of this information without needing extra panels. Thanks to actionable and collapsable notifications on Android, you only need one area for all of this. Safari is Safari – most people can’t stand it and prefer browsers like Chrome for their browsing needs. But one thing we thought was interesting in the new UI of Safari, was the tab view that shows all open tabs. They bragged about the 3D appearance, scrolling, and quick access to other tabs yet we have had this in Chrome for Android since it was first released over a year ago. Multi-tasking! iOS 7 has a new style of multi-tasking that only runs in the background when it thinks you want access to frequently used apps. It essentially learns from your patterns to help extend your battery life. That’s kind of cool, assuming it can learn properly, which we won’t know anything about until people can spend some time with it. But in general, we like the idea of phones learning our patterns to better optimize our lives with them. But in terms of a UI, Apple created something semi-unique. It’s not an exact copy of Android, since it scrolls horizontally and features full-screen previews of currently running apps. It does look a lot like what HTC did back with Sense 4, though HTC abandoned the look after hearing pretty terrible reviews of the change. Apple did in fact announce a Pandora competitor this morning called iTunes Radio. It’s really not all that game-changing or innovative. You can create your own radio playlists based off of songs, or you can use recommended stations that Apple has ready to go. There are massive “BUY” buttons all over the place, along with ads, unless you are an iTunes Match customer. But you can’t save full albums or tracks to your library like you can with Google’s new All Access service, nor can you pick and choose specific songs to create playlists. It’s just like Pandora in that it brings up songs that it thinks match what you are looking for and then allows you to downvote them or favorite them, so that they’ll play more often. It’s a nice add-on to iTunes, but nothing new. In terms of looks, the new Google Music and new Music apps look a lot a like. We’re seeing white menus and similar UI with big, bold album art. Also, we should point out that Google Music All Access gives you unlimited access to albums and songs because it comes with a monthly fee. While I don’t know how many people actually use the stock Mail app in iOS, it’s easy to see that they have stolen features from the popular iOS app called Mailbox. Apple added in swiping gestures, for deleting, archiving, and “More” options. It’s a complete copy of what Mailbox already made popular, and I can’t believe people aren’t throwing massive fits over this. But then again, this is what Apple does time and time again to its developer community. Oh, and Gmail has had swipe-to-delete/archive for longer than I can recall. The new iOS Calendar app doesn’t look all that much like that of Android, but the similarities are still there. We’re looking at an ultra-minimal design, with flat rectangles, pastel-ish colors, and a white background rather than the round appearance of the current iOS Calendar app. And in fact, the newest Calendar app from Google has similar design in the circular color picker and date chooser to what we are seeing in iOS, only it came out a couple of weeks ago. Apple added a bunch of slideout navigation drawers to apps like Mail and iMessage. We have seen these in Google apps for over a year now (even the ones on iOS), but they made a point of the addition today as if it were something “new” to app development. No, Apple, it’s not new. We already covered this here. 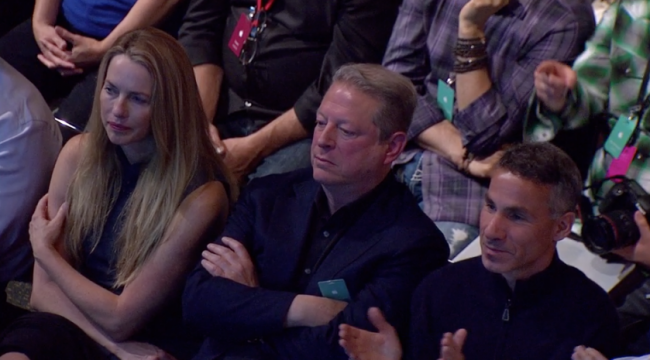 Actually, Al Gore has nothing to do with Android that I know of, but he was there. So, here is a picture of him looking flat. Semi-live Wallpapers: Apple showed off a new wallpaper that moved the background as you tilted your device from side to side. It’s almost like a live wallpaper on Android, but even more so like 3D Image Live Wallpaper that has been on Google Play for a while. Yes, you can get down with Apple’s fancy new wallpaper feature today, on Android. Auto-app Updates: I didn’t realize that Apple hadn’t introduced auto-app updates yet on iOS, but in iOS 7, users will finally have the option to update automatically. They joked about seeing the “Update” count climbing throughout the day and that iOS users would no longer have to worry about that. Add that to the list of things we take for granted on Android, already. Bing (hah! ): The new iOS in the Car feature introduced today uses Bing for search. Yes, Bing. Edit: Apparently it’s Siri that has Bing, making Siri even less of an important piece of the Apple pie, which I didn’t think was possible. Notification Sync: They touched on this ever-so-briefly, but I believe Apple mentioned that with iOS 7, devices will be able to sync notifications across devices. Google just started doing this with Hangouts on Android, but made a point of it coming to other apps in the future during their I/O keynote. Send-to-Phone: Apple showed off a send-to-phone feature from Calendar and Maps Mac apps today. Say you have a calendar item set up with a location or are looking at something in Apple’s newly announced Mac Maps app, you can send it quickly to your phone and have it readily available. Nice idea, but Google knows your searches thanks to Google Now and makes them automatically available to you on your other devices – you don’t need to send a thing. Maps for Mac: Speaking of Maps for Mac, hah. Google.com/maps is all I have to say. AirDrop: One of the more interesting features that Apple showed off today was called AirDrop. It allows you to quickly send information (photos as an example) to your friends’ iOS devices without the need to bump them together. Yes, they poked fun at NFC and the ridiculous tapping we have to do as Android users, in order to share things. Thing is, Samsung devices do this already with a little thing called WiFi Direct. Nice idea that is baked into iOS devices, though. Keep in mind that this feature won’t be available on all iOS devices – it’s limited to the new guys. I’m sure there were other things we could list, since the keynote was lengthy, but these were the new features or ideas that stood out the most. As you can see, iOS 7 is actually a pretty major change from iOS6, bringing it steps closer to the power of Android. It’s not going to kill Android or give Apple some immediate leg up on the world’s most popular mobile operating system, but it does make at least the design of their UI a hell of a lot more appealing. In the end, Android users saw a lot of what they are already accustomed to, which they have already grown accustomed to.